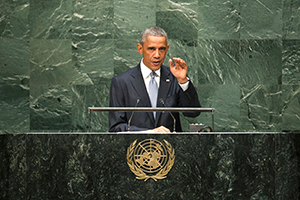 President Barack Obama addresses the general debate of the sixty-ninth session of the General Assembly, September 24, 2014. The determination of the United States to lead the war against global terror was signaled on September 24. Addressing the 69th session of the UN General Assembly (UNGA) in New York, US President Barack Obama said that the threat posed by the “cancer of violent extremism” has “perverted one of the world’s great religions.” The US, along with a coalition of 40 nations, would militarily “degrade and destroy” the so-called Islamic State (ISIS). The time has come, he said, for the world to explicitly and forcefully reject the ideology on which this violent extremism is based and “forge a new compact.” He called out those who make money from the global economy and then funnel it back to these groups. The sectarian conflicts within Islam needed to be urgently addressed, and he called upon the Islamic world, particularly the Arab nations, to concentrate on developing the potential of its youth. This, and the fact that he personally presided over the UN Security Council meeting, also on September 24, where it adopted Resolution 2178 dealing with foreign terrorist fighters, suggests the alarm bells are ringing. Resolution 2178 will be counted as one of the milestones in the development of the counterterrorism framework under the aegis of the UNSC, along with Resolution 1267, dealing with al-Qaeda and the Taliban, and Resolution 1373, adopted after 9/11. The rise of ISIS calls into question the effectiveness of the global counterterrorism strategy. Resolution 2178 seeks to get a grip on the growing threat posed by foreign terrorist fighters (FTFs) through action by individual countries, regionally and globally. Obama said that he looked forward to countries reporting to the UN next year the specific actions they had taken, in pursuance of this resolution, to curb the financing and movement of FTFs. The international community’s concerted efforts to evolve a global counterterrorism strategy notwithstanding, the global terror network is becoming more threatening and menacing. The enemy is no longer unseen or hidden. Al-Qaeda began to physically control territory in Yemen some years ago. Al-Shabaab has registered spectacular successes in Somalia. Boko Haram is taking over towns in northern Nigeria, and ISIS is holding territory in Iraq and Syria that is equivalent in size to the land area of the United Kingdom. Terrorism and violent extremism find breeding grounds either in weak and fragile states or in societies where freedom of expression is suppressed and civil liberties are seriously circumscribed. Chronic underdevelopment, deprivation of basic human rights, and restrictions on freedom of speech make terrorism and violence particularly attractive for the young unemployed. Terrorism has also received a major boost from policy-induced and ill-conceived decisions by the international community. Military action in Iraq in 2003, the arming of rebels in Libya and Syria by the West, and some of the Gulf states stand out. It is widely accepted that the use of force, whether authorized and legitimate or without legality, has unintended consequences. Equally, arming rebels is a bad idea. There are no “good” or “bad” rebels. All rebels are not only capable of turning “rogue,” but in fact do turn. How effective will the combination of military and political means be to degrade and defeat ISIS? A meeting convened by France on September 15 brought together 30 countries, and another 20 are expected to have signaled their readiness to join the “coalition of the willing.” It is important, however, to get the strategic diagnosis right. Arab states collaborating with the US in military operations provide the bulk of ISIS cadres. If these states continue with their repressive domestic policies, the very policies that incubated al-Qaeda in the 1980s, the problems will only be exacerbated. Unlike al-Qaeda, which demonstrated its capacity by carrying out terrorist actions on different continents but displayed reluctance to physically hold territory, ISIS quickly undertook territorial conquest and laid claim to the physical territory of the “caliphate.” It has been able to rally battle-hardened former Saddam Hussein loyalists and commands conventional ground armies backed by tanks and artillery, as well as a modern and sophisticated propaganda machine, which has managed to alter the political geography. It has clear aspirations to run a state. There is no sign yet of UNSC authorization being requested for military strikes in Syria. Such authorization is unlikely from a deeply divided council. Aerial bombardment without boots on the ground, and without addressing the policy-induced alienation that produced the jihadist philosophy in the first place, will be a major challenge. ISIS could also provide a most unfortunate precedent for similar caliphates in Libya and northern Nigeria. This article was originally published in The Indian Express on September 26, 2014.